Place both cans tomatoes & okra in a blender along with the onion, jalapeno halves, vegetable juice, cayenne pepper and salt; blend until almost smooth. Transfer to a container and chill for a minimum of 2 hours. 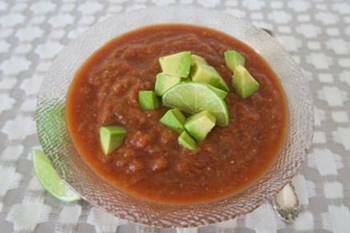 When ready to serve, dice avocado into small cubes and scatter over the cold soup. Serve with fresh lime wedges.